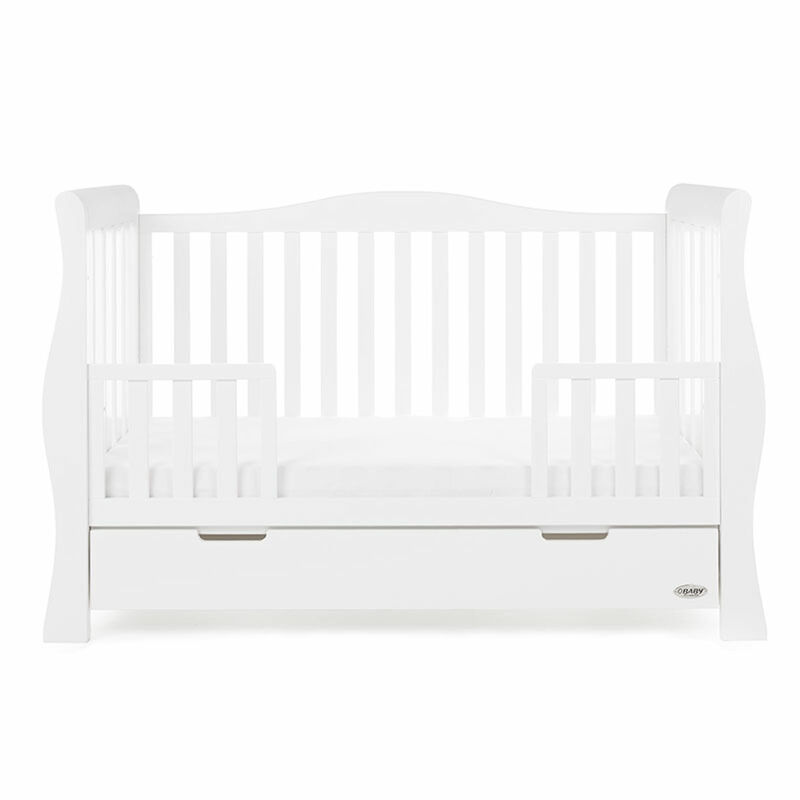 The stunning Stamford Luxe Cot Bed from Obaby comes with open slatted sides which are perfect for keeping an eye on your little one. 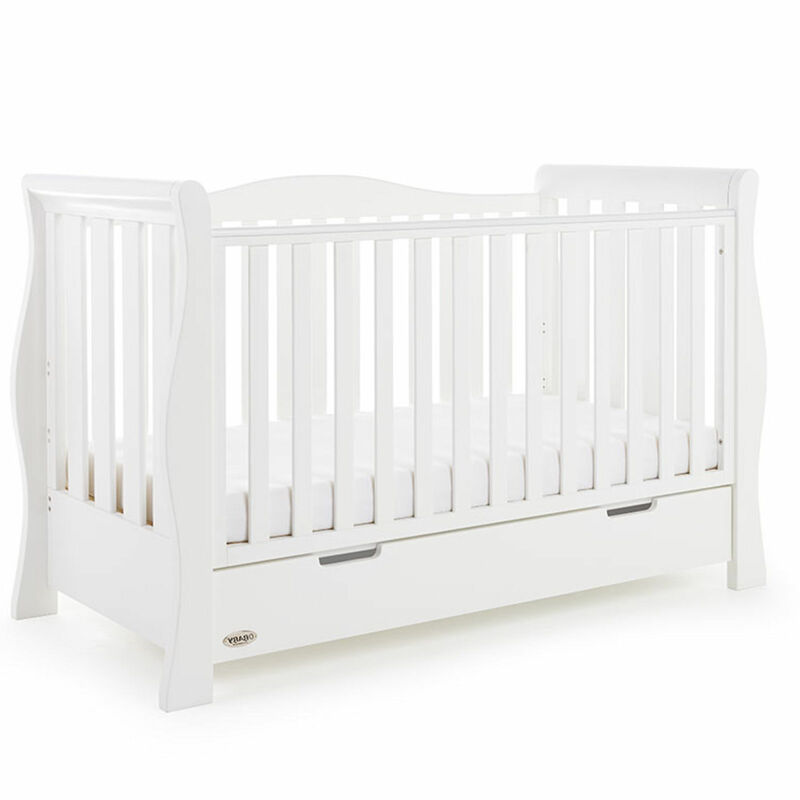 The beautiful cot bed comes complete with 3 adjustable mattress base height position and as your child grows the base can be lowered to provide extra safety and reassurance. With its elegant scroll design the cot bed easily transforms into a stylish junior bed and the included side rails help reduce the often disruptive transition caused from transferring from bed to bed. Once converted, the junior bed accommodates your little one until approximately 4 years and the under drawer is perfect for keeping your little ones clothes and essentials close at hand. 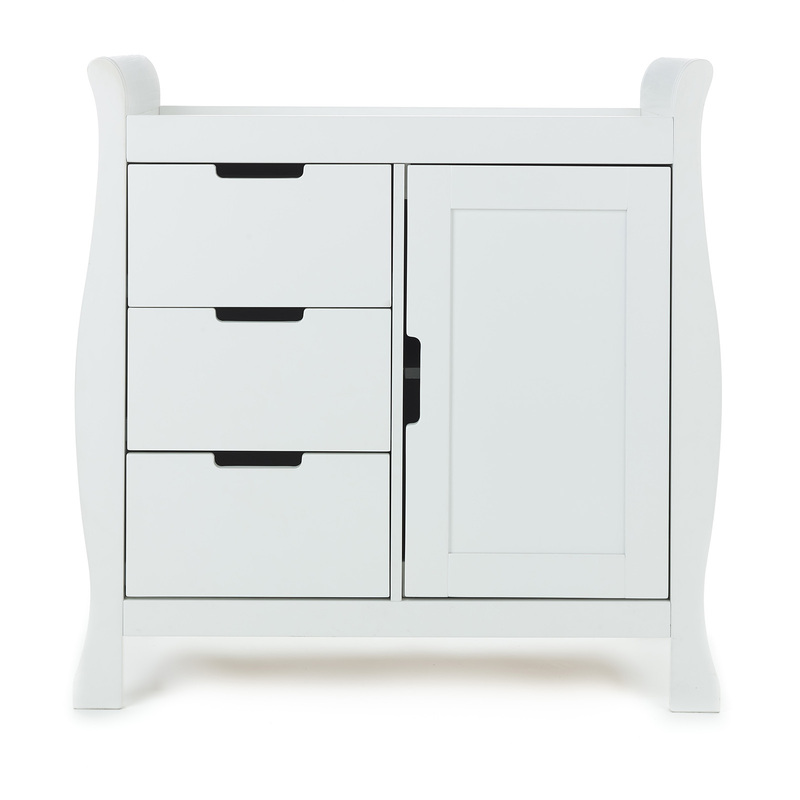 The exquisite Stamford changer is comprised of 3 generously sized drawers and a single shelved cupboard to house all of baby’s essential items such as creams, powders, nappies and wipes. The changing station also comes with a cleverly modelled space on top (with raised sides) which is ideally suited to accommodating a changing mat. With sleek recessed handles, a subtle scroll design and presented at a height which is both comfortable and convenient for nappy changes, the changer is sure to work in harmony with your nursery decor. In keeping with the Stamford’s curved scroll design the included double wardrobe works in perfect harmony with other pieces from the range. 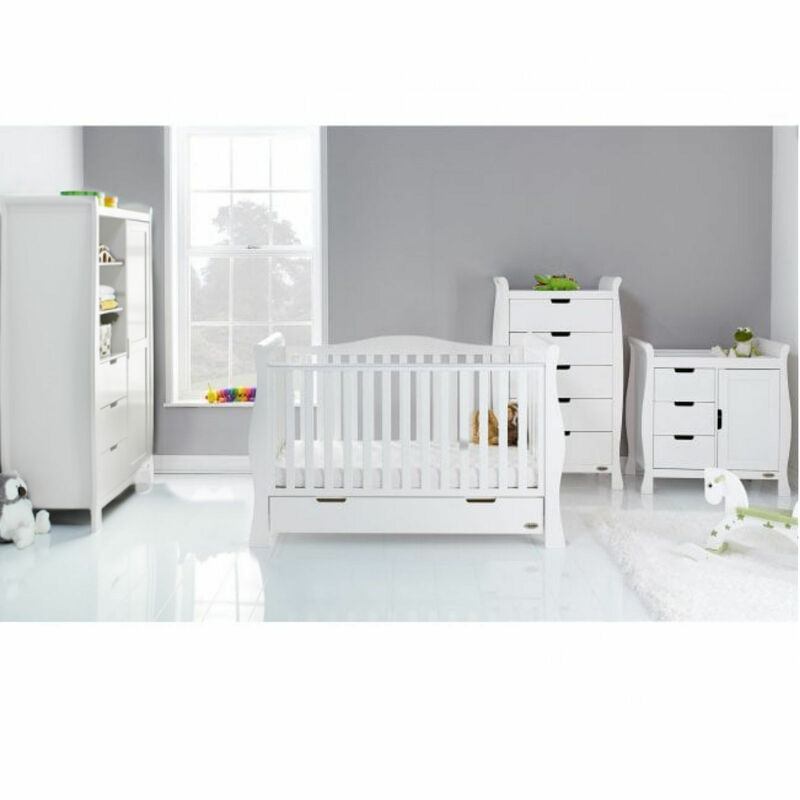 Crafted from solid wood and consisting of three adjustable shelves and three spacious drawers on the left hand side, while the right side contains one full length cupboard with two sturdy hanging rails, the Stamford Wardrobe is able to store all of baby’s clothes and accessories away in style. The fashionable recessed handles present a streamlined, sophisticated look and ensures that the unit is snag free and easy to use. 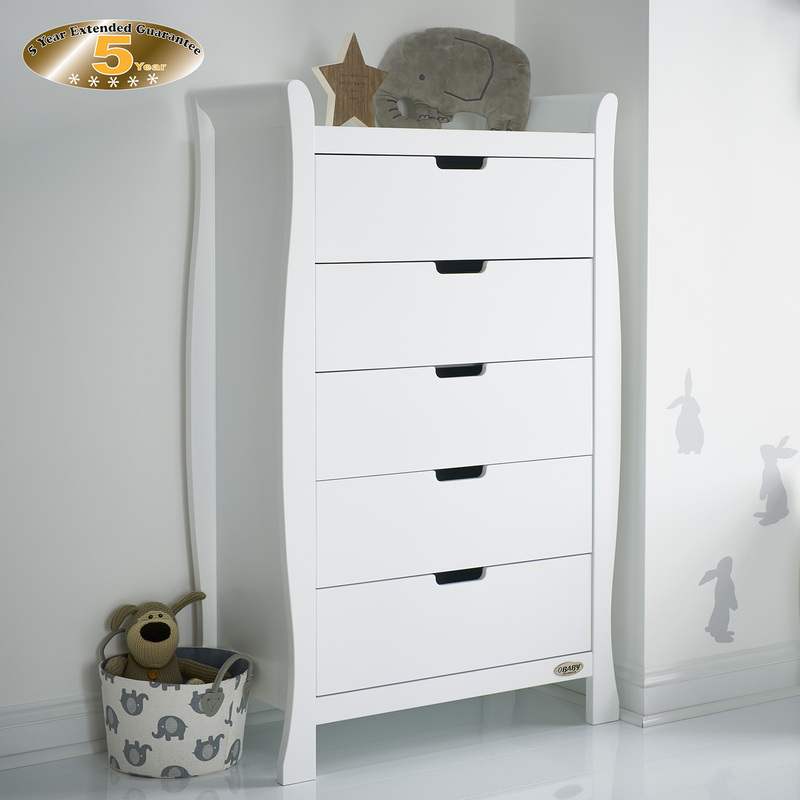 The elegant Stamford Tall Chest Of Drawers is made from solid wood with an easy-to-clean surface and featuring 5 individual drawers and stylishly recessed handles, the set of drawers is a great space-saving solution and is perfect for housing baby’s clothes and essentials.